Greetings, Vestige. You are about to embark on a continent-spanning journey, one rife with magic and peril, treasures and terrors. You are about to enter a world where you can spend weeks – months – years of adventure, by yourself or with friends, growing ever more powerful as you range further and further afield from your humble beginnings. There’s just one teensy little wrinkle: You’re dead. 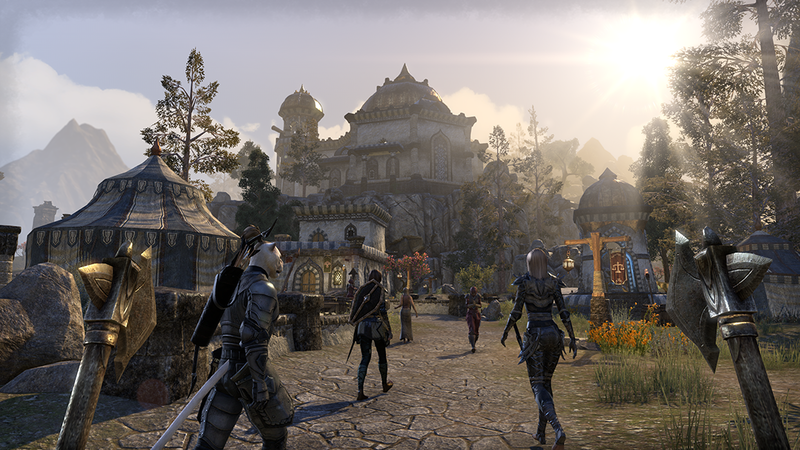 Welcome to The Elder Scrolls Online: Tamriel Unlimited, a massively multiplayer adventure where you get to save Tamriel once again…along with a few thousand of your closest friends. Massively multiplayer RPGs have existed on PCs for decades, but ESOTU is one of a very small number to make the leap to consoles. We’ve already written a bit about what you need to know before jumping in; now let’s take a look at what you can expect in your first handful of hours. Back to you. You’re still dead. Sorry about that. 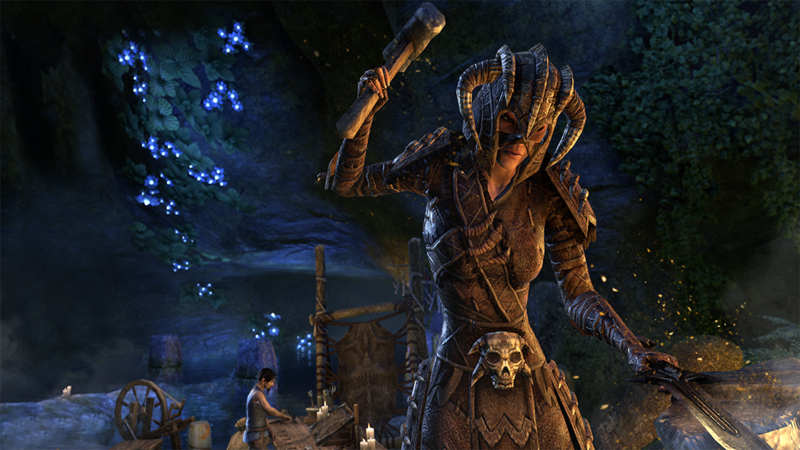 Your adventure in The Elder Scrolls Online: Tamriel Unlimited starts where most adventures end: in the afterlife. Well, an afterlife. Sort of. It’s complicated. Before we get to that, though, you need to know just who you are. As with any Elder Scrolls game, you have a pretty crazy amount of choices with regard to customizing your in-game avatar. But unlike previous games, your most basic choices will determine much more than innate skills or talents; ESOTU offers three distinct areas and quest selections based on which of the three Alliances you join. Before that, however, you must pick from one of nine different races, each of which is associated with a specific Alliance. Want to be a Breton, Redguard or Orc? You’ll be a member of the Daggerfall Covenant, ranging through Tamriel’s rugged Northwest. Aiming for High Elf, Wood Elf or Khajiit? You’ll join the Aldmeri Dominion, based in the lush Southwest. And Dark Elves, Nords and Argonians make up the Ebonheart Pact, based in the snowy Northeast. Next it’s time to pick a class. ESOTU offers four primary archetypes: Dragonknight, Sorcerer, Nightblade and Templar. Dragonknights are warriors with a generous dose of offensive magical ability; Sorcerers are magic-users with a focus on summoning; Nightblades are assassin types, exploiting stealth and trickery; and Templars are warrior-healers, able to deal out damage to enemies and minimize damage to allies. There’s a lot of variety there, certainly. But here’s something to remember: Your class can be a totally fluid thing. You’ll get a set of three skill trees based on your initial class, but aside from that you’re free to customize your character in any way you see fit. Want to bulk up a Nightblade with heavy armor and two-handed weapons? Go for it. Want to train your Sorcerer in the ways of swordplay as well as magic? Go right ahead. Your character is your character, so feel free to experiment. Now it’s time to decide your character’s appearance. And goodness, are there a lot of options. Height, build, skin color. Heroic, soft, or angular face. Arm size, waist size… posterior dimensions. And of course miniscule tweaks to nose, eyes, hair, mouth – you can pretty much make your avatar look however you want. Once you’ve tweaked your appearance to your satisfaction, it’s time to go explore. And by “go explore” we mean explore the contents of your prison cell. This is an Elder Scrolls game, after all. But never fear: You’ll quickly meet up with one of the major players in ESOTU’s overarching story: Lyris Titanborn, a half-giant Nord who arrives just in time to help you escape, and to fill you in on some important details. Like, for example, the fact that you’re dead. See, you’ve been sacrificed to a Daedric Prince named Molag Bal, and imprisoned in his private plane of Oblivion, known as Coldharbour. You may suspect this is a bad thing. You would be correct. However, Lyris is here to help; she hooks you up with a weapon and teaches you the basics of combat, most notably how to block properly in order to stun your enemy, and how to interrupt an enemy who’s charging up a devastating attack. It’s useful stuff. 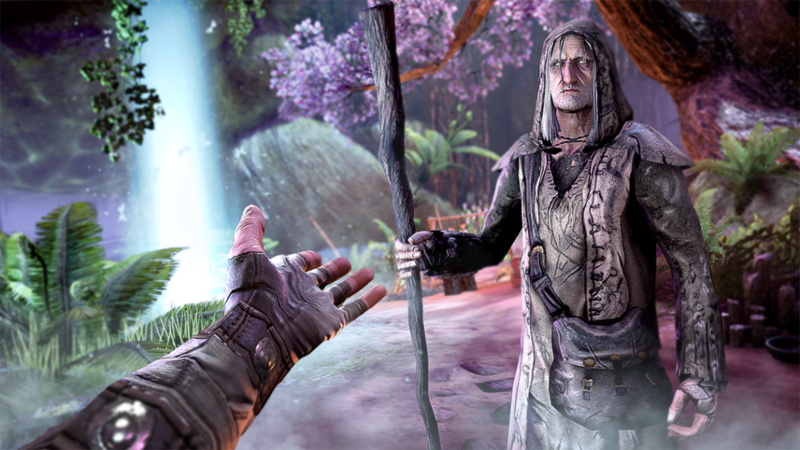 Soon you meet one of the most important characters in Tamriel at the moment: The Prophet. (Well, you meet a projection of him, but he’s mystical like that.) The Prophet fills you in on more details, and offers a wonderful glimmer of hope: He can get you out of Coldharbour and back to Tamriel. But first you have to find him and free him. “You must rescue me,” he says, “and I in turn must rescue you.” See? Mystical. So, with Lyris at your side, you’ll hack through Molag Bal’s minions on your way to the Prophet’s cell. Along the way you’ll learn more of the fundamentals of ESOTU, like leveling, sneaking, lock-picking and, if you’re observant, treasure-collecting. Once you locate the Prophet, though, you’ll discover that he can’t just waltz out of his cell like you did. He needs someone to take his place. Fortunately, Lyris is an awfully nice lady. And fortunately, the Prophet is a man of his word: He escorts you to an Anchor Mooring – a portal between Coldharbour and Tamriel – and after just a small bit of bother with a 20-foot-tall bone creature, you’re on your way back home. Only, as we mentioned earlier, “home” depends entirely on which Alliance you’ve chosen to join. Members of the Daggerfall Covenant begin in the bustling city of Daggerfall, home to King Casimir. Those allied with the Ebonheart Pact begin in the exotic Davon’s Watch, currently under attack by those pesky Covenant types. 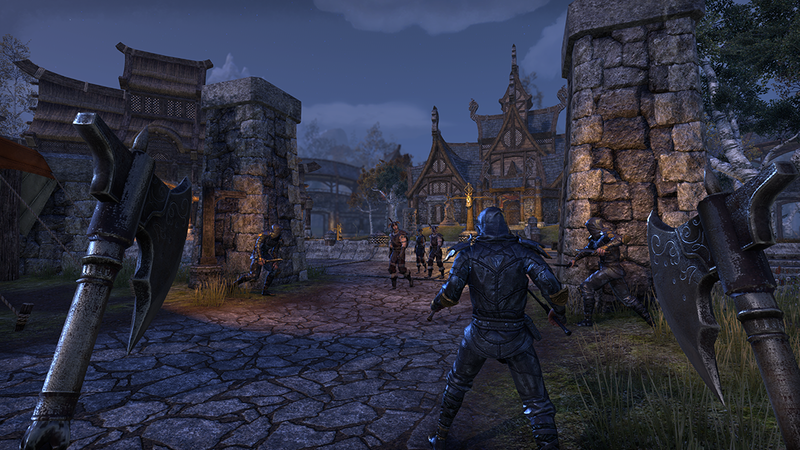 And members of the Aldmeri Dominion materialize in Vulkhel Guard, a sprawling and picturesque town on an island off the southwest coast of Tamriel. And from here? You’re free. You’re free to follow the Prophet’s advice and track down the kind souls who pulled you from the drink. You’re free to ignore his advice altogether and head off into the countryside. You’re free to explore the town, learn a trade, go fishing – it’s up to you. Each Alliance offers its own vast array of experiences, from far-reaching quests of political intrigue to quick-and-dirty dungeon crawls found nowhere else. Should you decide to follow the Prophet’s guidance, however, you’ll find similarities in all three Alliances. First, you’ll find a character near your starting point who can point you toward the folks who rescued you. This is a “quest-giver,” and if you haven’t played many massively multiplayer games, you might be in for some surprises. Now, it’s likely you’ll see other players crowding around quest-givers. Do not be alarmed; this is normal. Many others will be walking the same path as you. But you don’t need to wait your turn – just wade in and engage with the NPC, and he or she will give you undivided attention. 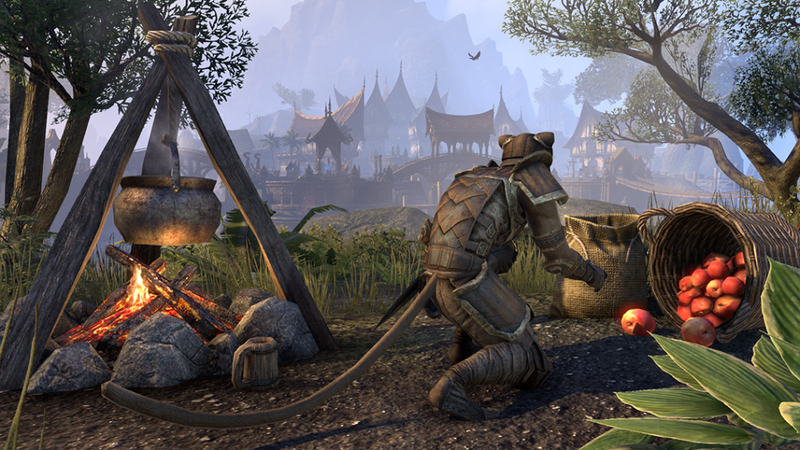 If you’re familiar with Elder Scrolls games, it won’t come as a surprise that you’ll be meeting up with more and more quest-givers as you progress in ESOTU. Keep in mind that how you address those potential quests is totally up to you. You can take them one by one, making sure to finish off a quest before taking on another. Or you can talk to everyone with a quest icon over their heads, rack up a huge number of options in your Quest Log, and polish them off in any order you choose. You won’t be penalized for either approach, so do what feels most comfortable. One thing you should know, though – especially if you’re most familiar with single-player console RPGs – is that Tamriel is huge. Seriously, huge. And it contains some places that are really, really nasty. Some quests, even early on, may send you into those nasty areas…and nothing will artificially prevent you from going there, even if you’ve just started the game. So keep an eye on the suggested level indicators in your Quest Log before you stray too far from your starting areas. But don’t worry; as you complete more quests, you’ll grow in power, able to roam more freely with confidence. If you do want to take on tougher baddies, though, remember that you’re never alone. At any given point in the game, you’ll be able to group up with friends, or make new friends out of friendly strangers. The initial few hours may feel a little solitary, but that’s by design, to let you get your feet under you before heading out into the great wide world. As you ease into the ESOTU experience, you’ll have periodic help from the Prophet, who will guide you along the path to fulfilling the game’s most crucial quests. You’ll grow in power in ways you can hardly imagine. And you’re going to have a few thousand fellow travelers to help you out if you get into a jam. And hey, how tough can it get? After all, you’ve been dead already. It’s all downhill from here.